Photo above courtesy of Aaron Roseli, all others courtesy of Northstar-at-Tahoe Resort. There is no more fun than getting dirty! Remembering back, I was the kid that would fall down then immediately run to the house to wash off my hands. But, I’ve found, I’ve grown to love it. And my recent experience at Northstar-at-Tahoe’s extensive Mountain Bike Park, just reinforced this yearning for grit in my teeth. 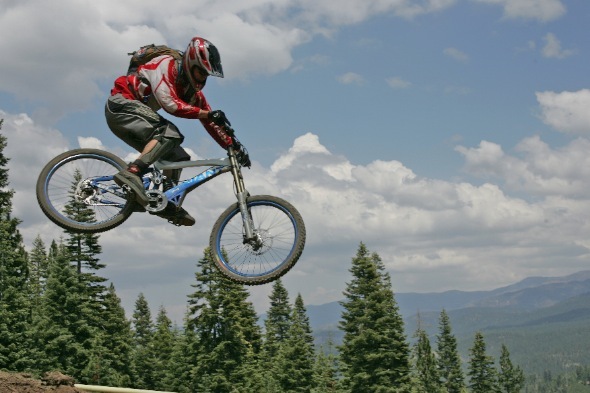 I’ve been riding a bike since before I could do simple math I’m sure, and been riding mountain bikes as recreation for the past eight-plus years, but had yet to experience the thrills of lift access downhill mountain biking. My recent trip to Northstar-at-Tahoe began with meeting Jeff “Shep” Shepherd, the head instructor and one of the innovators of Northstar-at-Tahoe’s style of mountain bike instruction, at the Plaza Bike Shop within the Northstar-at-Tahoe village. We filled out all the necessary paperwork and waivers and headed to the gondola. On the trip up to mid-mountain, Shep explained that the goal of the Northstar-at-Tahoe’s team of mountain bike instructors is to get riders up to speed as quickly as possible in the areas of safe riding practices, bike and trail familiarity, and comfort with the terrain and style of riding needed for an enjoyable experience on the mountain. Shep is the hub on the mountain, as seen by the rest of the instructors and bike shop staff. While I was suiting up at the mid-mountain bike shop, he was inundated with questions, requests, feedback from other riders and staff about today’s conditions, trail reports, class sizes and the overall vibe of that day’s riding. You can see Shep eagerly looks for feedback and gleans insight on things as they arise. Once all the paperwork was out of the way, Shep and I rode to the top of the Zepher lift to begin our journey. After gearing up at the mid-mountain Giant bike shop, we mount up and Shep runs through some basics and familiarization with the bike. We roll over to the lift and head to the top of the mountain. Shep and I hop off the lift and roll out. Shep takes me on a gradual grade, green run to show me some very basic, but very helpful, braking techniques. Shep explains the importance of having all the riders on the mountain solid on the basics for a safe ride for everyone. After this, Shep shows me some turning techniques and the proper way to load the bike’s massively squishy seven-inches of suspension that also prove to be essential for big mountain riding. Shep accelerates the instruction and quickly I am comfortable with buzzing down the hill on his rear tire, popping over small washes and softball sized rocks and roots. Shep turns down us down an intermediate (blue square) run and picks up the pace a bit. We are rolling along at a good clip and I realize how much these bikes can really take. Shep is now showing me things like proper lines on turns, and how to use the bike to its fullest. He provides helpful tips on places where he sees I may not be maximizing the tires or bike’s ability and points out some of the things he sees I am now more comfortable rolling through. Shep stops us about mid mountain to assess my comfort level and see if I have any questions. He gives me the choice to continue as we have, or to try a little more challenging trails. I eagerly vote for the latter. I follow Shep as he darts off the main trail onto a trail called “The Woods.” There are sweeping banked switchbacks with deep berms. We come to a steeper , well groomed section and Shep points out a wooden feature he wants to show me. I can tell it’s going to be a challenge by the fact that I can see the well worn “chicken-out” route to the right, from many riders just opting for the less hair-raising ride. Shep rolls up the ramp and onto the top deck with me in tow. He’s showing me the roll out, which consists of about ten-feet of a ~70° drop-off ramp into another 15 feet of steeply sloped run-out of dirt into and off into the woods. Shep looks at me and asks if I’m down. I am close to that point of being locked up with apprehension, and I’m pretty sure he can see it on my face. He explains the proper technique of rolling over and off such a drop and I soak it in like a sponge because I want to do this. Shep takes us back up the trail a bit to get enough run in to get up and over the stunt properly. He rolls in to show me how it’s done. Up, over and he vanishes with a whoosh over the wooden lip. All I can hear is the free-wheel and chain of his bike. A second later I hear a shout of encouragement as he peeks out from the other side, far down the trail. I take a deep swallow, put my foot on the pedal and roll down. My apprehension has me hard on the brakes and I barely have enough speed to roll up the ramp. I am obviously not going fast enough to do this safely and stop at the top to soak in another view of the daunting drop on the other side. Staring down it, it feels like 50 feet up. I wave it off like I was just scoping it out, but I’m pretty sure Shep saw right through that. I was really determined to do this, but my mind was telling me to bail out and go around…well it was more likely screaming that. I take one last glimpse, then I hike-a-bike back up to the starting point to give it a go. I throw a leg over and point my bike downhill. Little or no brakes this time, I am committed with no backing out, I roll up and across the top. As my front wheel rolls up to the edge, I concentrate on Shep’s advice. I slide over the edge and in a flash I’m down the face and rocketing towards Shep and the trail ahead in a blaze of adrenaline and an amazing rush of accomplishment. With my new confidence, and the realization that my limitations were me, we take off down the mountain, ready for more. I catch glimpses of roots, rocks and small drops that I would normally shutter going over, or intentionally go around on my normal mountain bike, but the Giant Faith I am riding soaks it all up as if it were screaming for more. I can’t seem to give it enough to satisfy its ravenous appetite for trail. Shep and I are now blasting through tight switchbacks, winding our way through the tall sierra pines. All too fast, we’re at the bottom and Shep and I part ways as he rides off to take his next group of riders on their mountain adventure. 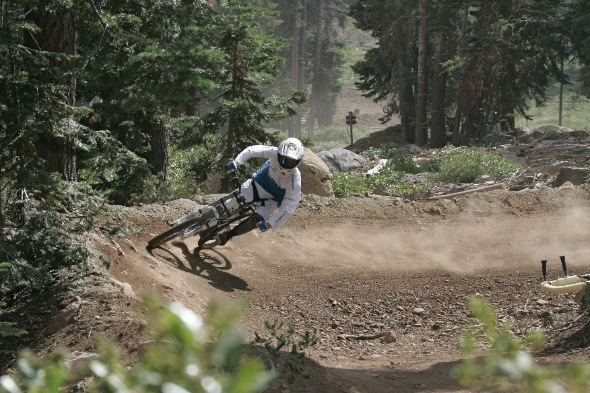 Northstar-at-Tahoe’s Mountain Bike Park is constantly evolving and growing. They offer combo and Stay-and-Play packages so you and friends can visit and play. But hurry, winter is closing in and Northstar-at-Tahoe will be forced to switch gears to the snowy adventures. Call 1-800-GO-NORTH or visit them online at northstarattahoe.com.